I post many of my t-shirt yarn rug photos on my Facebook, Pinterest and Instagram, but thought it was about time to load them here as well. For some of them I have free pattern links that I can share with you. And then some of them are without a pattern. I will start with the doily rugs and then move on to Mandalas and Granny Squares. The second one was my first t-shirt yarn doily rug from a pattern. You can read all about it and find the pattern on Sara Rivka’s blog. Her blog is full of creative craft and crochet ideas. Anne-Marie made a larger version of the above pattern by adding more rounds. She is a very creative crocheter, and like me, addicted to t-shirt yarn! lol! Her white rug is 125 cm in diameter. Do browse her blog for some lovely basket patterns as well. I love this classic doily pattern. I worked from a pattern in a Crochet Magazine. because it is very easy and you can make it as big or small as you want. The following rugs were orders from clients. I did not follow any pattern. If you have worked with t-shirt yarn a lot, you will know that every ball/skein of yarn differs from the other in texture and elasticity. Which means, no two balls of t-shirt yarn will have the same result with the same pattern. Sometimes the yarn just tells you which pattern or stitch will work best for it. And when an order has to be a specific size, you also need to adapt the number of rounds in the pattern to get to the requested size. For this one I started with my own Pink Doily Rug Pattern, and made a few changes. This pink and grey one was also an order. I took photos of each round and will do a photo tutorial one of these days. I hope you enjoyed looking at Anne-Marie’s and my rugs! We really love making them. If you struggle to find the ready cut t-shirt yarn where you live, you can always make your own from old t-shirts. Here is a link to a post on Craftsy where Kathryn Vercillo explains how you do that. Do make sure you like our Facebook Page where we show you more of our crochet creations. Please inbox us there for any orders. We also share other t-shirt yarn rug patterns and know-how’s and we like showing you our followers’ crochet projects as well. Hope to see you soon! I have more rug pattern links to share with you. And I am also working on a little crochet pouch and a beautiful flower pattern. Hier is my heel eerste reuse doily mat wat ek met T gehekel het. Selma by die wolwinkel se eerste reaksie was: “dis belaglik mooi!” Dit was in April hierdie jaar. En van daar af was daar net geen einde nie. Die rooi mat se patroon is geskryf deur Sara’s . Haar patroon is baie goed geskryf en maklik om te volg. Ek het hom met ‘n 10mm hekelpen gehekel omdat dit die enigste groot hekelpen is wat ek toe gehad het. Dit het my 2 aande geneem om die mat te hekel. As mens eers begin, kan jy dit net nie neersit nie, want jy wil sooooo graag die eindproduk sien! En wanneer die mat klaar is, kan jy nie ophou kyk nie, want dis soooooo mooi. This was my first giant doily rug with T-shirt yarn which I crocheted in April this year. I thought it was the most beautiful rug ever! Crocheting with T is relatively new in South Africa. I had to search quite a bit on the internet to find suitable patterns. Most of the ones I did find, was from overseas blogs. It was also almost impossible to find big crochet hooks. 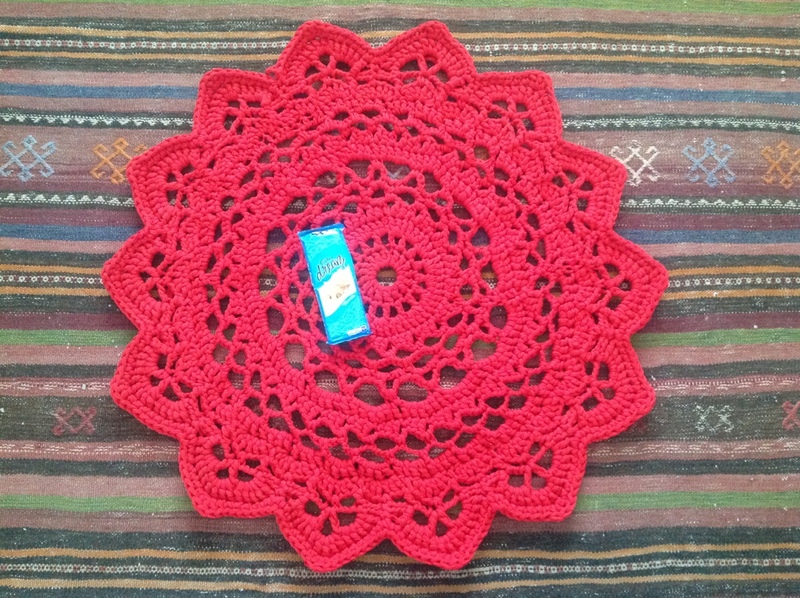 This red rug was crocheted with a 10mm hook with Sara’s pattern. Luckily the pattern was well written and quite easy to follow. I can only sit down to crochet when all my girls are in bed at night. Especially if I want to try out new patterns. I finished the rug in two evenings. Once you start, you cannot put it down, because you want to see the end result. And once you’re finished, you cannot stop looking at your rug. And while you are crocheting the last rounds of your rug you’re already thinking about possible colours and patterns for the next one! Ons plaaslike wolwinkel in Vredenburg, 50 Something, (10 min se ry vanaf Paternoster) het sommer baie gou begin uitvind waar mens T en reuse hekelnaalde in die hande kan kry. En nou hekel almal badmatjies en mandjies en alles en nog wat met T. Ekself het sedertdien sowat, plus minus, min of meer 20 T-matte, baie mandjies en nou ook Krismisboomversierings gehekel met T. En ek gaan nog mettertyd almal vir julle hier wys en ook ‘n patroon of twee deel. Our local yarn shop in Vredenburg, 50 Something, (10 minute’s drive from Paternoster) quickly sourced bigger crochet hooks and T shirt yarn for this new craze in the crocheting world. Since then I’ve crocheted about, plus minus, more or less 20 T -rugs, lots of T-baskets and with Christmas nearing, lots of Christmas tree decorations as well. Each and every item I crocheted with T is very unique and beautiful. I am going to show them all here and share a pattern or two as well.